Sark with an area of just 2.1 square miles is the smallest of the 4 main Channel Islands and was until recently (2008) a feudal island. Sark was the last European territory to abolish feudalism. La Coupee, a spectacular sight which is 300 ft high with its razor edged isthmus joins the main island, Greater Sark to Little Sark and the Venus pool perfect for bathing at 20 feet deep. Step back in time in beautiful Sark. Traffic-free and overflowing with natural beauty, the island is easily reached by ferry from Guernsey. Stunning coastal views and a picturesque rural interior are best experienced either on foot or by bicycle (available for rent on the island). There are also a number of good restaurants and hotels for those wishing to stay longer than a day. 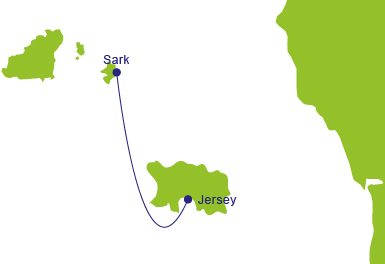 Highlights are La Seigneurs of Sark with its beautiful gardens; despite being the closest to France, Alderney feels more remote than any of the other Channel Islands. It's a paradise for nature lovers, a combination of landscapes and wildlife that are easily accessible from Guernsey by air or sea. There are over 30 miles of walks that wind their way over cliffs and golden bays, across exposed commons, past Victorian fortresses and World War II batteries alongside the scenic golf course.